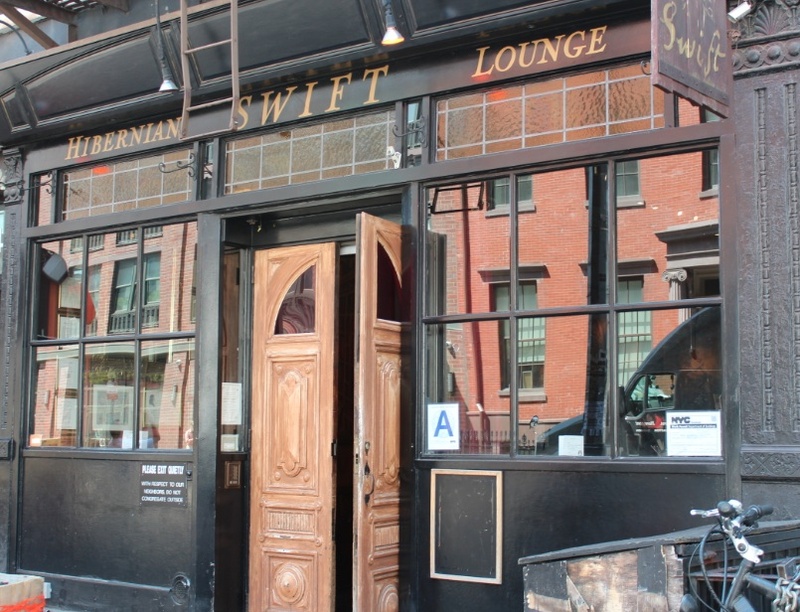 NEW YORK, NY – My first visit to the Swift Hibermian Lounge in Manhattan’s East Village (or is it NoHo?) was on a chilly October night when the bar had a special beer drink called the Jack O’Lantern i.e. Guiness with pumpkin ale, if memory serves – an important caveat, as this was a while ago and was not the evening’s first beer stop…….. I still remember how toasty and warm the pub (and the drink) made me feel, and I’ve had fond memories ever since. And, it’s not just me who feels this way – Swift Hibernian Lounge was recently named as one of Esquire Magazine’s Best Bars in America 2012. Please excuse me for a moment while I pat myself on the back for my exquisite taste….. The Swift Hibermian is a prototypical Irish pub, complete with chatty Celtic bartender, drunken regulars and church pew booths. 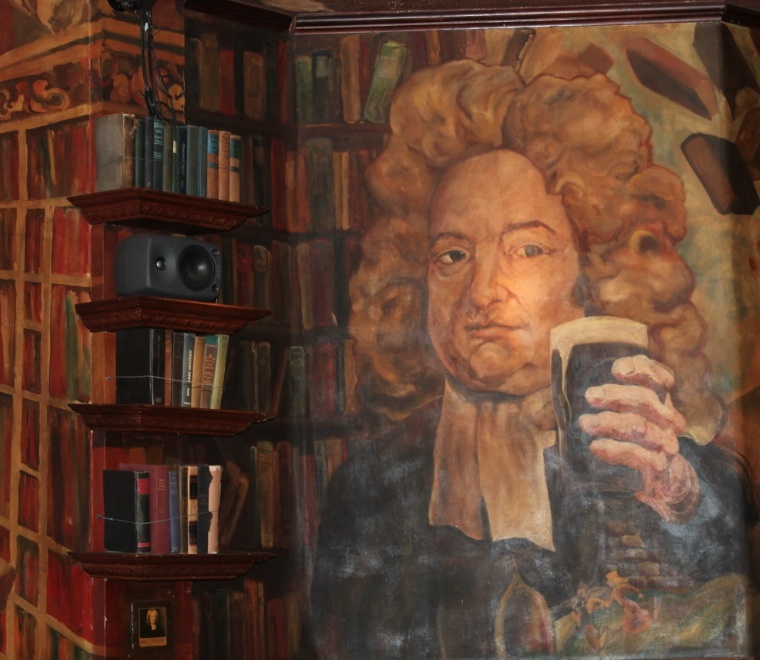 But this one is done with more style and lyricism than your average ale house, owing to its namesake and the lovely old-school mural painted on the walls, including a depiction of Mr. Swift himself enjoying a pint. Oh yeah…..there’s also the fabulous beer selection (by my count, around 60 bottled choices and over 20 on tap), and loads of whiskey and Scotch options. Food is also on offer and the short menu is a bit eclectic, including British (Shephard’s Pie, Sausage Rolls), Latin (ceviche) and American (mini-burgers) influences. If you’re going, shoot for a weekend afternoon or very late night, when things are a bit calmer and you can really soak up the atmosphere. 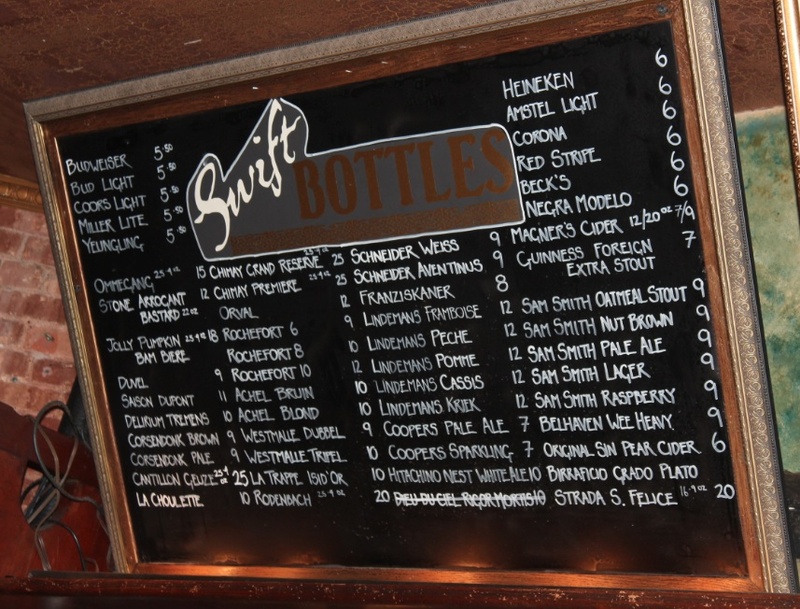 What is the little thing that makes Swift Hibernian worth a visit? Cozy Irish pubiness done with panache. Where is it? 34 East 4th Street (between Lafayette and Bowery), New York.